The deep devastation following Hurricane Harvey has left many people looking for ways to be of assistance. But even small gestures can make a world of difference. 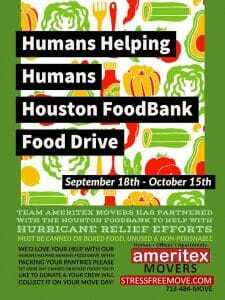 Ameritex Movers proudly announces our partnership with the Houston Food Bank in the Humans Helping Humans food drive. Find out what you can do to help! Now through Oct. 15, we are accepting donations of nonperishable food items to help your fellow Houstonians who suffered under Hurricane Harvey. Our moving crews are currently accepting donations. Participation is easy, especially during the moving process. While you’re packing, set aside unused nonperishable items from your pantry that you’d like to donate. On moving day, your moving crew will collect your donations in 4-foot boxes. We will award a large prize to the mover with the most food donations at the end of the donation period! Please try to donate healthy, whole grain, or low-sodium options when possible. The Houston Food Bank cannot accept baby food, homemade items, or items beyond their expiration dates. The Ameritex team thanks you in advance for your contributions to the Humans Helping Humans Food Drive. Your generosity directly provides nourishment for families and individuals affected by Harvey. To read about other ways Ameritex is committed to our hometown, visit the Love Our Community web page. There are also many more available opportunities to donate or volunteer to help Hurricane Harvey victims. In the end, we are all Houston strong.